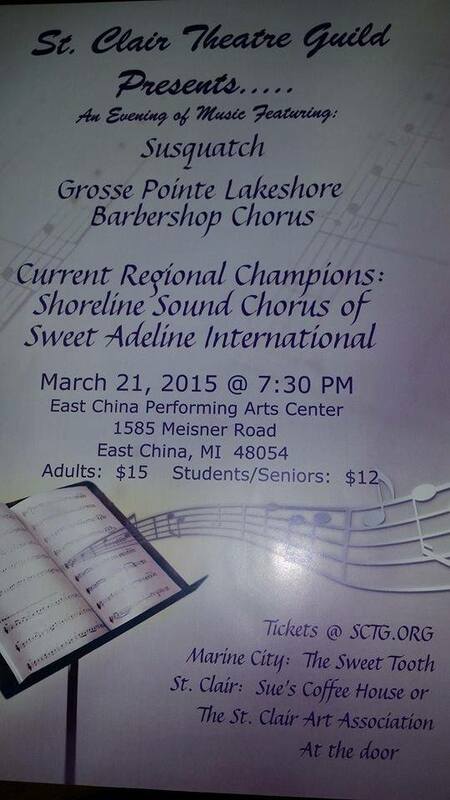 The St. Clair Theatre Guild is proud to present “An Evening of Music” on Saturday, March 21st at the East China Performing Arts Center. Tickets can be bought in advance at the St. Clair Art Association or Sue’s Coffee House in St. Clair or at The Sweet Tooth in Marine City; reserved online by clicking this link, or bought at the door. It will be a great night of singing and fun. Come support SCTG and the performing arts while having some fun! This entry was posted in Events, Performances on March 10, 2015 by Tom Kephart.